Have you written yourself a garage door maintenance checklist yet? If you haven't, it might be time to write down some notes. You don't want to take risks with your door. Whether you use it once a week or ten times a day, it's equally important to take a few minutes and perform a checkup on a regular basis. If you hear strange noises or find anything else that is out of the ordinary, you should definitely give your door a thorough examination. Every single part of your overhead door needs to be in a great condition in order to keep the system's performance safe and smooth. Garage door adjustment is important for two reasons. First: if the door needs to have its balance corrected, it means that there is a little gap when it shuts down. This would compromise your security, and could also allow rodents and other pests to sneak inside your garage. The second reason is that the springs could be wearing out. 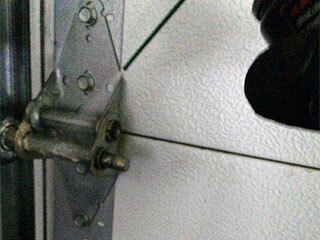 Since these components counterbalance the weight of the panels, any problems with the door's balance would imply that there is a garage door spring problem. That doesn't bode well, but it's not necessarily as bad as it may seem. It usually means that their tension needs to be adjusted, which is a task that - although not as complicated as spring replacement - still requires an expert's assistance. Our professional technicians will happily help you with this procedure. The photo-electric eye that your opener uses to detect an obstacle should be facing each other. Misaligned sensors may fail to see you passing under the door, and if someone was to use the opener to close it at that moment... let's just say, things wouldn't end up well. You can prevent this type of accident by making sure the wires are connected to the eyes, that their lenses are clean and - most importantly - that they are positioned correctly. Wave your broomstick under the door while it's closing. If it reverses its operation, then the eyes are working correctly. If it does not, you need to get your sensor realigned as quickly as possible. There are a couple of switches at your garage door opener's control panel that determines the distance the door will travel. Hence, the name. If the travel limit value is too small the panels may leave a gap open between them and the floor. If it's too much, the door could slam to the floor while it's closing. You should check to make sure neither of these scenarios occurs. Apart from the three tests that we've specified here, it's important that you also check the tracks, rollers, and pulley system, as these components are directly responsible for the smooth movement of your door. If you discover a problem of any kind, contact our team at Garage Door Repair Phoenix right away.